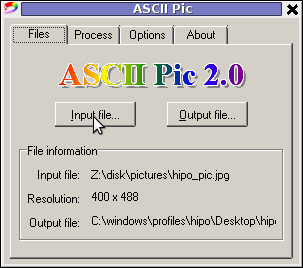 A friend of mine, just mentioned about a program ASCIIPic – capable of converting graphic images in JPEG to plain text ASCII in Microsoft Windows OSes. 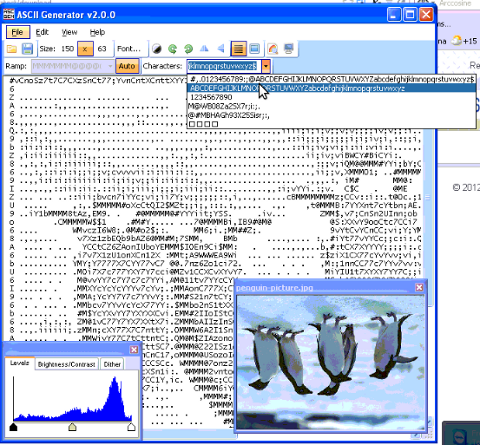 Yesterday I blogged about caca-utils (img2txt) – console tool to convert picture graphics to plain text ASCII , so knowing of the Windows freeware ASCIIPic existence catched my attention and I decided to give it a try to get idea what is situation with Images to ASCII text convertion in Windows? 🙂. As I don't have a Microsoft Windows OS at hand, I downloaded it and run it on my Debian notebook with WINE (Wine Is Not an Emulator) MS-Windows emulator. 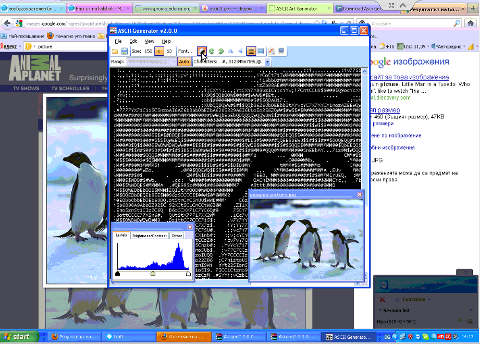 For my surprise the program run succesfuly its GUI interface and worked pretty smooth even emulated on Linux. As of time of writting, the latest version of the freeware program available is 2.0. You see in above screenshot the program is pretty intutive to use. You select an Input file, an Output file and you're ready to Process the image to TXT. 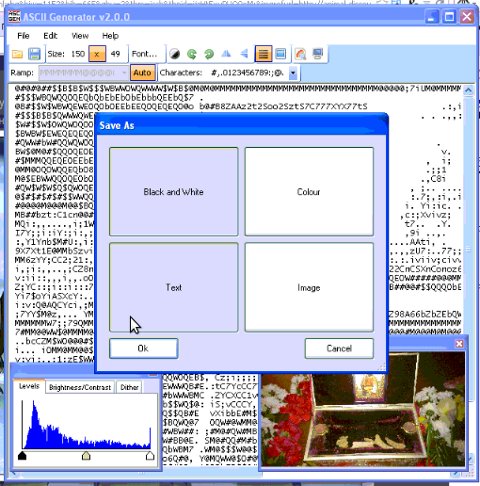 One small note to make here is the program couldn't recognize as Input files images in PNG or GIF formats, it seems the only image formats the program recognizes as input are JPEG and BMP. I thought some improvement to the produced ASCII image might be possible from the app options so I played around with the Zoom, Negation, Brightness and Monochrome options, none of them had a drastic change on the output. 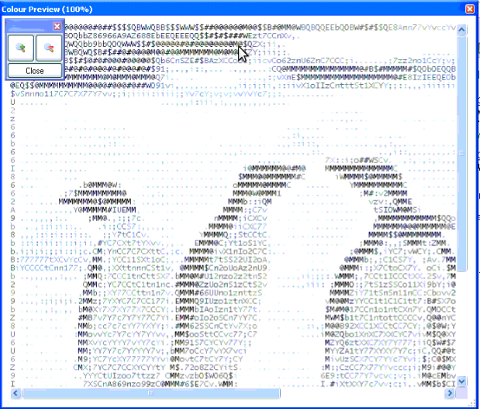 Using any of the program options didn't make the output TXT "image" to look closer riginal JPEGs.. If I have to compare ASCIIPic produced ASCII Images to libcaca's Linux img2txt, asciipic's ASCII images are a piece of crap. jp2a is a free GPL-ed software available for all major operating system architectures Linux, BSD, Mac OS X, Windows. 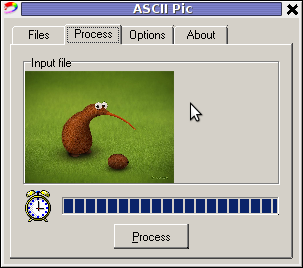 jp2a is a command line tool and lacks any GUI interface but if compared to ASCII Pic the output ASCII image is awesome. 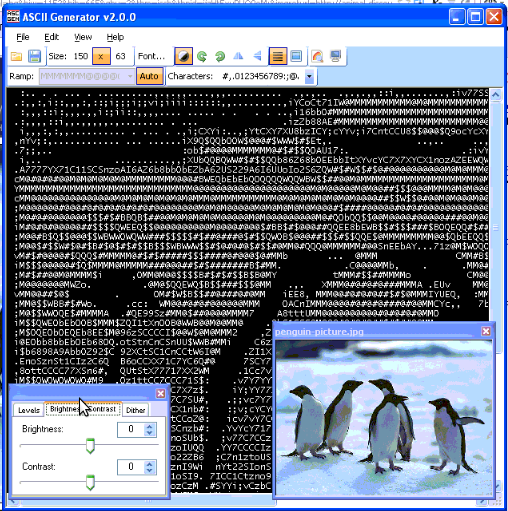 ASC 2 Gen is actually the best I can find program to convert images to ascii in Win as of time of writting. Just like img2txt it generates pretty decent looking text images. ASC2Gen failed to run emulated on my Linux host with wine version 1.0.1, hence to test it I used a a Windows host via teamviewer. 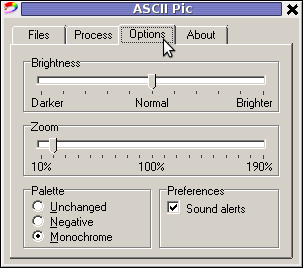 Something else nice is it supports a lot of image file formats as input including (BMP and GIF) images. 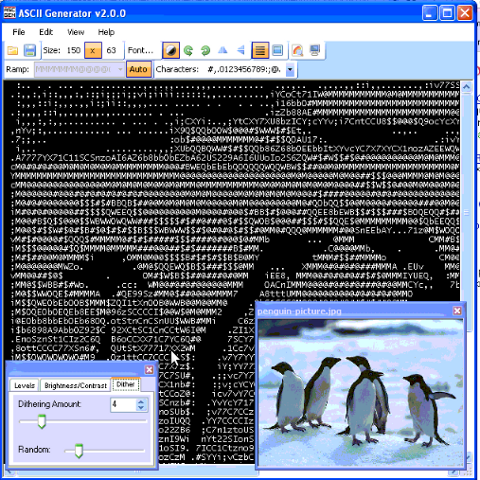 While researching online, I found plenty of other Image to ASCII geneartors, however as I didn't tested them I can't say if they are better ones. Anyways I will be happy to hear if anyone knows other good ASCII generator alternative progs for Winblows? Convertion of PDF to images is useful, however as PNG and JPEG graphic formats are raster graphics the image quality gets crappy if the picture is zoomed to lets say 300%. This means convertion to PNG / GIF etc. is not a good practice especially if image quality is targetted. I myself am not a quality freak but it was interesting to find out if it is possible to convert the PDF pages to SVG (Scalable Vector Graphics) graphics format. The traditional source way compile and install is described on the homepage. For Debian users pdf2svg has already existing a deb package. Once installed usage of pdf2svg to convert PDF to multiple SVG files is analogous to imagemagick's convert . Installing on BSD is possible directly via the port and convertion of PDF to SVG on FreeBSD, should be working in the same manner. The only requirement is that bash shell is used for the above little bash loop, as by default FreeBSD runs the csh. On FreeBSD launch /usr/local/bin/bash, before following the Linux instructions if you're not already in bash. I've received a PDF file with a plan for development of a bundle of projects, My task was to evaluate this plan and give feeback on the 44 pages PDF document. Since don't know of program to directly be able edit PDF files on GNU / Linux ?, my initial idea was to open and convert the PDF to ODT / DOC with OpenOffice (Libre Office) and then edit the ODT file. Unfortunately Open Office oowrite program was unable to open / visualize the PDF file. My assumption is OO failure to open the PDF is because the PDF was generated on Microsoft Windows with Adobe illustrator or smth. The idea that came to my mind as alternative, way to edit the PDF file was to convert it in pictures edit and then convert the pictures to PDF.
. This prior article was exactly describing how to complete Step 3.Therefore all left was to find a way to convert the PDF file to multiple JPEG / PNG / GIF images. Actually in Step 1 I was aiming to do the opposite of what I've previously done. Hence, in order to convert the singe Project.PDF file to multiple PNG images, I just switched convert IN / OUT arguments order. I've done the PDF to pictures conversion on my notebook running Debian Squeeze (6.0.2) GNU / Linux.Convertion of the PDF file to 44 images, took 25 seconds on my dual core 1.8 Ghz / 2GB RAM Thinkpad r61. Anyways even if GIMP is used to modify the different PDF pages as layers, once completed GIMP doesn't have the ability to save the file as PDF and therefore once saved the file if merging of layers is done the resulting picture becomes ONE BIG MESS. is still the only way to "modify PDF" in Linux or BSDs. I will be glad to hear if someone has come up with a better solution? I had to create a number of Facebook and Twitter accounts for one of the companies where I am employed. As I had to put Avatars to each and every new account. I therefore had to resize the company logos to fit the to the avatar dimensions.. If however you prefer to have a sky scraper picture in Facebook, this is possible as thumbnail pictures up to 180×540 w/h pixels are showing up in FB. At most cases FaceBook automatically resizes the uploaded picture and generates a thumbnail which in most pictures looks okay, however in some odd picture dimensions the picture preview might be messy, so its better to ship the profile pic in standard square size like 151×151, 256×256, 313×313 etc. In Twitter again the avatar picture should be a square like, to have twitter during upload automatically resize and make a good looking pic thumbnail. If some picture with a non square dimensions is uploaded as an Avatar for twitter account usually, twitter's pic auto resize server side program chops parts of the picture. This is not a bug but expected behaviour. In Twitter another requirement is that the uploaded avatar image does not exceed 700kb, trying to puload a picture over 700k fails. In both Facebook and Twitter the uploaded Avatar logo should be in format JPEG, GIF or PNG . I've red some people claiming the size of the Avatar logo in Facebook could have some impact in terms of e-marketing, but I'm not sure if this is a fact or some false rumour. Anyways it is sure that a wide sky scraper like picture allows you to show more even from the profile and maybe through the picture have larger influence over the audience. with vinegar, and put it on a reed, and gave him to drink.